ANAHEIM, Calif. – From the time he started playing hockey at age 9, Toni Lydman has been a defenseman. The Anaheim Duck defenseman knows little of joining the rush, leading a two-on-one or the adrenaline-infused thrill of a breakaway. Well, there was that one time when his junior coach put him at forward. "I must have been 16 or 17," Lydman said. "I was sick or something. I didn't have any practice. I don't know if we were missing a player or something but he asked me if I could play fourth-line center." That experiment didn't last long. Lydman was one of the better skaters growing up in Finland, and his coaches needed him to patrol the blue line against the opposition's top players. Not exactly a glamorous role, but Lydman took ownership of it. "It was just fun, chasing the puck," he said. "It didn't matter where I started in the faceoff." It's still fun for Lydman, who has built a career out of skating backward, blocking shots and tying up sticks. He's done it as consistently as any defensemen in the NHL this season, and the Ducks are counting on that as they return to the postseason after a one-year absence. Lydman finished second in the League a plus-32 rating, an even more impressive statistic considering he spends almost all of his ice time defending the Joe Thorntons and Daniel Sedins of the NHL. How solid has Lydman been? He had only three games with a minus rating in his first 42 games this season and was a plus-or-even in 64 of his first 76 appearances. Probably the best example of his stability came Feb.16. Anaheim turned in one of its worst defensive performances of the season when it was thrown around like rag dolls against the Washington Capitals, yet Lydman came out of a 7-6 loss with a plus-2 rating. While other defensemen get noticed because of their offensive flair, Lydman flies under the radar while doing the dirty work. He ranks in the top 10 in the NHL in blocked shots. "He's a guy that you don't see out there much," Ducks defenseman Luca Sbisa said. "He's not flashy. But he does the little things really well, especially in the defensive zone. He never gets caught out of position. He never seems to get beat on the one-on-one. Those are things that fans maybe don't see, but as players, we really respect that. Those guys, they play big roles in the playoffs….We know how important he is to our team." Sbisa's locker is next to Lydman, and he often picks the veteran's brain. Sometimes when Sbisa is on the bench, he'll watch Lydman's positioning on a certain play. "I watch how he approaches things, how he kind of angles guys, how he always stays inside of his man," Sbisa said. "Those are things I'm trying to pick up from him." 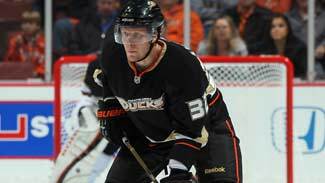 That type of mentorship to Anaheim's younger defensive core - Sbisa, 21, and Cam Fowler, 19 -- is a bonus that Lydman brought to the Ducks when he signed a three-year, $9 million deal July 1. The move was essentially relegated to the transaction wire in most newspapers and was seen as a fall-back signing by the Ducks, who were thought to be in the running for higher-profile free-agent defensemen such as Dan Hamhuis, Paul Martin and Zbynek Michalek. Lydman became even more of an afterthought when he missed training camp and the first four games of the season with a bizarre case of double vision. Without him, Anaheim was outscored 13-2 in its first three games and its shaky defense came under heavy scrutiny. The Ducks tightened it up and now sport one of the more dynamic defensive partnerships in the League with Lydman playing the steady yin to Lubomir Visnovsky's freelancing yang. Visnovsky is the NHL's leading defensemen scorer and a Norris Trophy candidate, and he credits some of that to Lydman's conservative style that facilitates his risk-taking. "I'm more confident if I play with him," Visnovsky said. "I'm a small guy and I play more with the puck. Toni takes the body and I take the puck….I say this: I play better when I play with him." Their unique partnership is part of why Lydman, 33, is truly enjoying his first year in sunny Anaheim after stints with Calgary and Buffalo earlier in his career. It helps that fellow Finns Teemu Selanne, Saku Koivu and Jarkko Ruutu are teammates. Selanne and Koivu receive most of the attention and will certainly be in the spotlight when the postseason starts. The Dany Heatleys and Pavel Datsyuks of the NHL are waiting for him. "It is a challenge, you know?" Lydman said. "Those guys get paid for to make plays and score goals, and I get paid for breaking their plays up, or trying to. It's not always that easy but you're just trying to make sure they don't get any unnecessary chances, and make sure if they make a nice play, they deserve it." Sounds simple, right? After all, it's just chasing the puck and having fun.